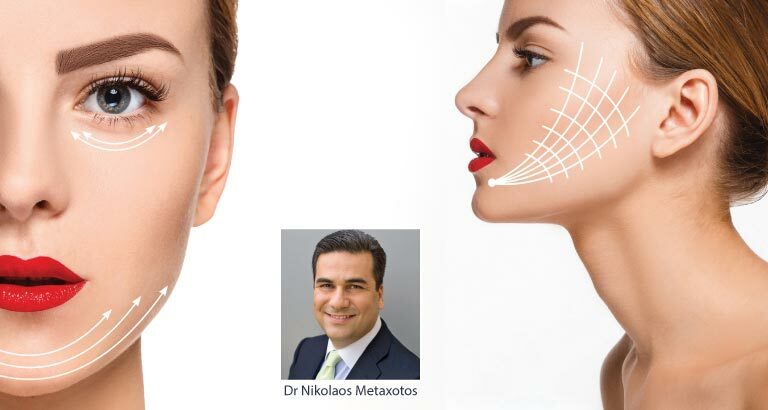 Specialist plastic surgeon Dr Nikolaos Metaxotos, MD, PhD, explains his revolutionary non-invasive process. These days, the most popular aesthetic facial procedures are those that are minimally invasive, with a short recovery time and maximum results – which is well aligned with our philosophy, ‘Minimum Intervention, Maximum Effect’. In line with this, at Symmetria we use the 3 Steps Non Surgical Lifting method, combining minimally invasive treatments that correct the signs of ageing quickly and successfully, offering a renewed appearance to the face. PDO threads and injectable treatment for fine lines and wrinkles. Lifting using PDO threads is an innovative, non-invasive method of rejuvenation, lifting and tightening the skin on the face, using absorbable threads. Some of the advantages include the impressive results in appearance, the fact that the treatment is pain free, incision free and blood free, and the ability to resume normal activities immediately after the treatment. The threads are inserted into the dermis of the skin using a thin needle, to create an internal mesh. By doing so, they cause an inflammatory response, which speeds up angiogenesis and collagen and elastin production, ultimately resulting in the reduction of superficial wrinkles, and tightening the skin. Following this, a protein complex is injected into the skin, which includes botulinum toxin (Botox), which smoothens the wrinkles on the forehead, in between the eyebrows and around the eyes. The active ingredient is injected intramuscularly using a very thin needle, therefore making the procedure virtually painless. Around 15 days later, autologous mesotherapy platelet-rich plasma (PRP) is applied, which stimulates the blood plasma, rich in proteins and minerals, resulting in firmer, more nourished and hydrated skin. In addition, the platelets release growth factors that promote the production of collagen and elastin. This is a natural treatment for facial rejuvenation, which hydrates the skin and erases wrinkles, using active ingredients that come from your own body. Last but not least, injectable hyaluronic acid is implemented approximately two weeks later. This treatment leverages the natural component of the skin to improve loose skin and add some volume to the face by filling out wrinkles to reduce their appearance. It also improves the shape of the lips, and hydrates and tightens the skin in a safe, impressive way. The 3 Steps Symmetria Non-Surgical Face Lifting procedure is directed towards people with the first visible signs of photoageing, mild relaxation of the skin and fine lines. It offers immediate rejuvenation of the face, tightening, lifting and ‘erasing’ of wrinkles — what more could you ask for? Dr Nikolaos is the founder of Symmetria.